The only way to motivate the mathematics curriculum is to model and analyze interesting physical phenomena. Two typeof physical systems are studied in the CWT series, mechanical and electrical. 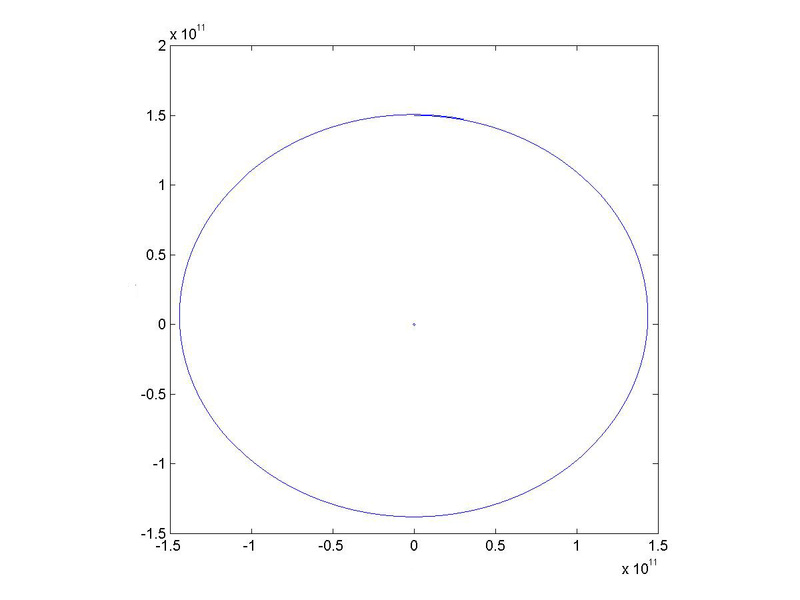 In this page we extend the examples in the CWT series to two dimensional orbits (not possible in the books because trigonometry is required). where G is the gravitational constant, mE the mass of the earth, R the distance between the centers of the earth and the object, and the minus sign is there because the force is downward. 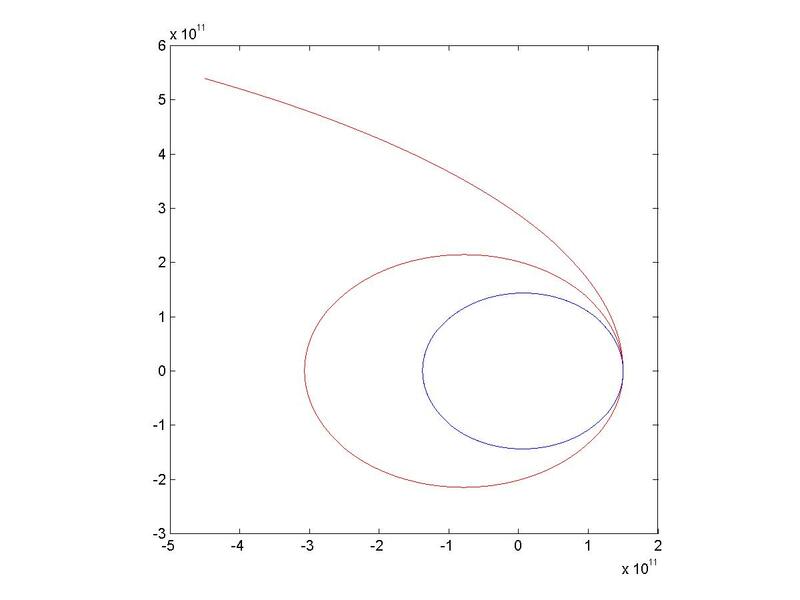 Orbits are two dimensional, and in two dimensions it's necessary to resolve forces and accelerations into their x and y components. 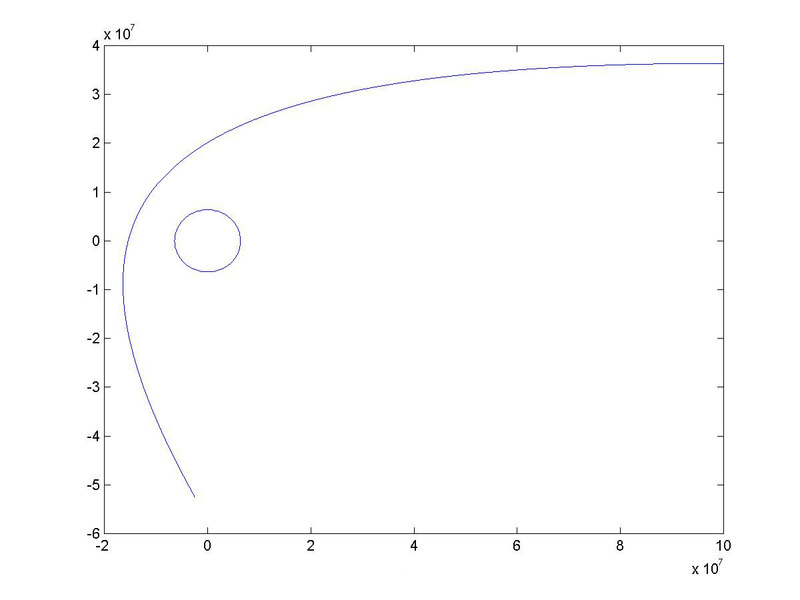 If the magnitude of the force of gravity on an object at coordinates (x,y) is g, then the x component of gravity is g*cos(a) = g*x/R and the y component is g*sin(a) = g*y/R where (R, a) are the polar coordinates of (x,y). That's it for the math. We will model a falling object above the earth. 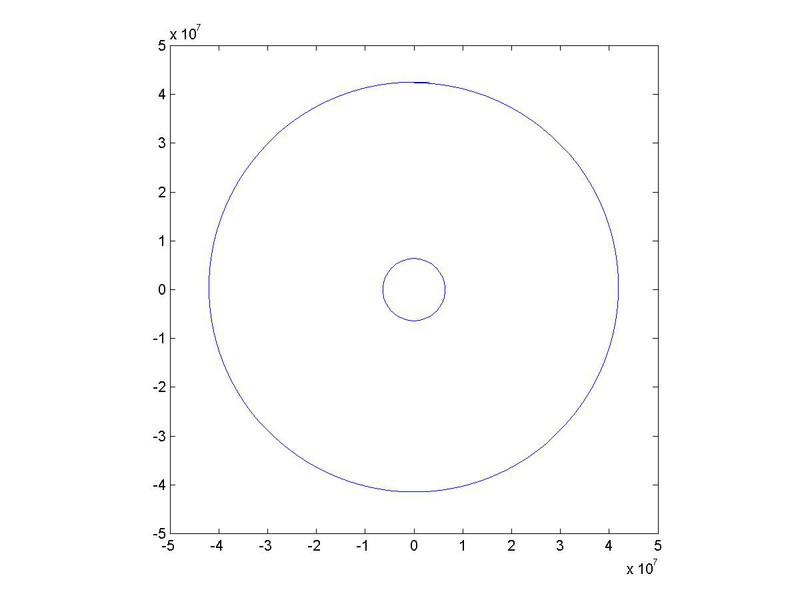 The coordinates of the center of the earth are (0,0), and the coordinates of the object are (x,y). 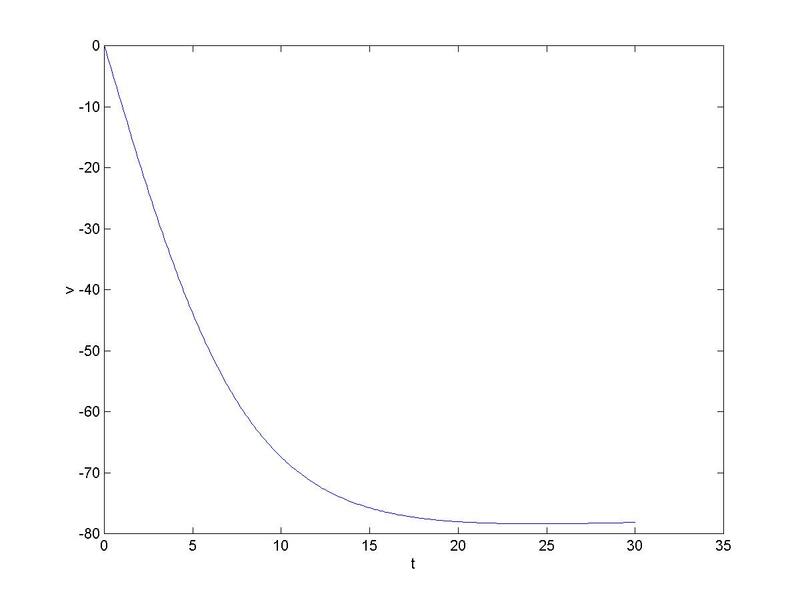 We will model a trajectory of duration T seconds and divide it into N subintervals, numbered 1 to N, of lenght dt = T/N. As the trajectory is computed we'll keep lists (i.e. 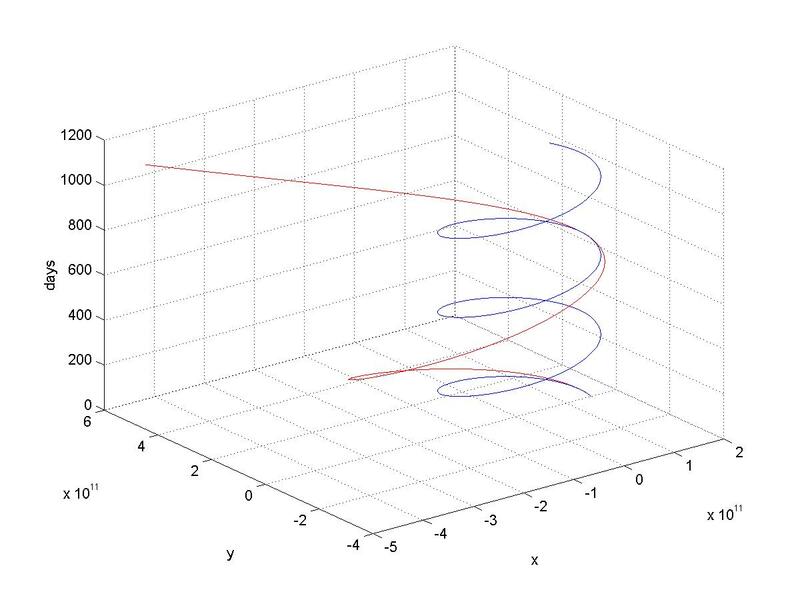 MATLAB vectors) of the time, the x and y positions, and the x and y velocities at the start of each subinterval, in vectors named t, x, y, vx, and vy respectively. The basis of the model is the code that advances time, position, and velocity from the start of one subinterval to the start of the next next. It is given below. We'll refer to this code as DRAW EARTH. where Fd is the magnitude of the drag force, p is atomspheric density, v is the object's velocity, CD is the object's coefficient of drag, and A is the object's cross sectional area. The direction of the drag force is opposite to the direction of the velocity. Amospheric density is 1.3 kg/m3 at sea level to falls to 0 at altitude 35 km and above. 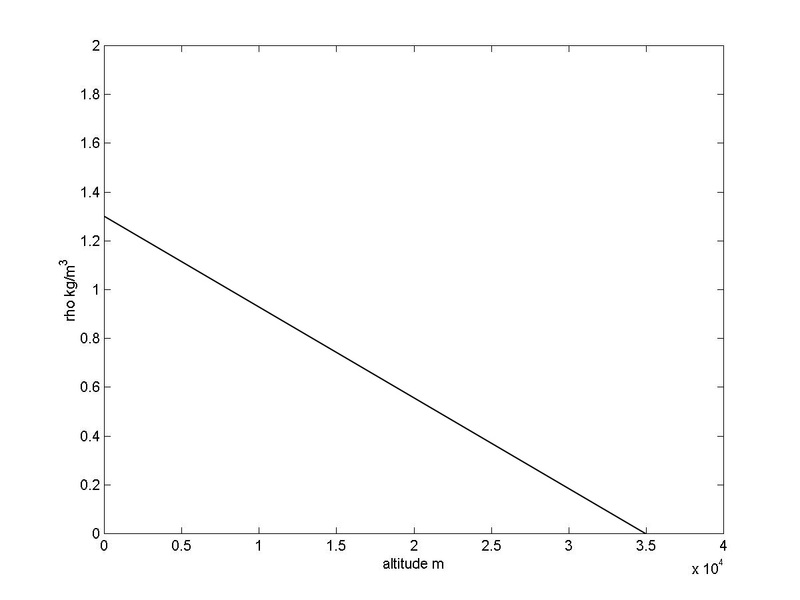 We implement a simple linear model of atmospheric density shown in the graph. The US launched a probe to Jupiter on Aug. 5, 2011. The trip to Jupiter will take five years, and utilizes a slingshot, or gravity assist, trajectory. The boost rocket put a Centaur upper stage and the Jupiter probe into a low orbit around the earth. The Centaur then launched the probe into a deep space orbit around the sun that will return to the earth in two years! The gravitational field of the earth will then accelerate the probe and send it on its way to Jupiter. The flight of the probe is un-powered except for two deep space maneuvers a year into the flight. 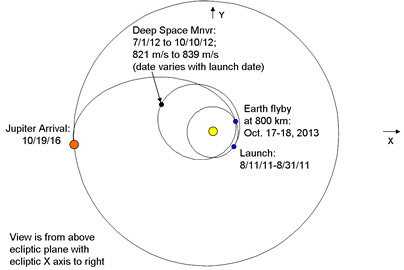 A diagram of the actual planned trajectory is shown in the figure. Once the probe detaches from the Centaur booster it is acted on only by the gravitational fields of the earth and the sun (except for the two deep space maneuvers which we will not model). 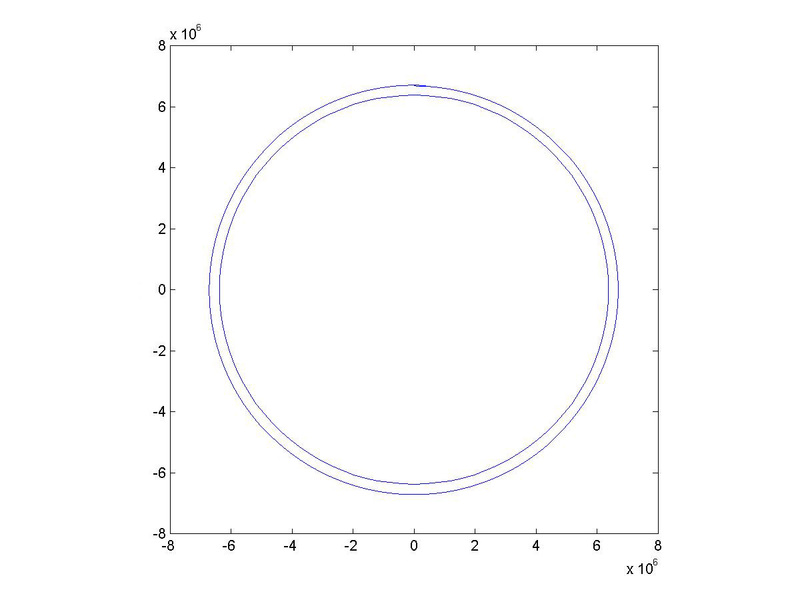 In an example above we computed the earth's orbit around the sun. We will also need to compute the probe's trajectory. The forces acting on the probe are the gravitational force of the sun on the probe and the gravitational force of the earth on the probe.